Have we been underestimating the Earth’s sensitivity to GHGs? Recent studies suggest that science may have underestimated the climate’s sensitivity to greenhouse gasses. Armour 2016 discusses upward-adjustments in historical-era estimates of temperature sensitivity to account for the location of ocean surface temperature measurements, different types of climate-forcings, and time-delayed response. Friedrich et al 2016 found that the Earth’s climate-sensitivity over the past 784,000 years was greater than what the current (CMIP5) suite of climate models would suggest. 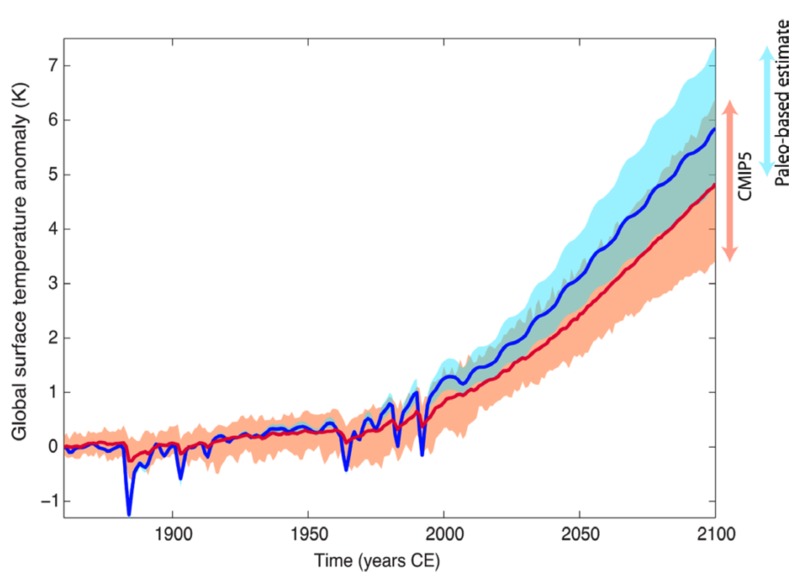 Critical questions remain in how quickly the climate responds to forcing. Paleoclimatic estimates of climate-sensitivity over the Pleistocene suggest that the current suite of CMIP5 models may underestimate the climate’s sensitivity. Figure from Friedrich et al 2016. Shown is RCP8.5 emission scenario. This entry was posted in Uncategorized on November 10, 2016 by joaaelst.